Toshiba XD-E600 review | What Hi-Fi? Toshiba would like us to get rather excited about its upscaling DVD players. Why? To be honest, we're not sure. Upscaling, should you need reminding, is the process by which standard definition video content, via DVD or off-air broadcasts, is made to fit a TV's resolution. 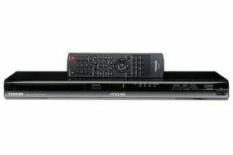 All modern televisions, DVD and Blu-ray players can do this, and have been able to for some time, which makes us wonder if Toshiba's pushing of its new upscaling players and XDE technology is something of a diversion while it plays Blu-ray catch-up. This 'extended detail enhancement' feature gives us three picture modes – sharp, contrast and colour – which, Toshiba says, will help you tailor the performance to suit your content. We found 'sharp' to be the most satisfactory of the three, but the improvements were far from huge – and no different to altering your TV's settings. Everything else you'd expect is here, with 1080p/24fps upscaling via HDMI, Dolby Digital and DTS decoding, a USB input and the ability to play MP3s and view JPEGS from disc or USB. And we're happy enough with the performance. It may not be much to look at, and the remote – no sign of a backlight – is about as exciting as an episode of Countryfile. That said, play Tropic Thunder and the image proves clean, bright and stable. Colours are a little over-egged and lack a touch of subtlety but it's very watchable. Sound, while certainly decent, nevertheless lacks a little detail and scale compared with slightly more expensive players. It's a safe performance, and a generally good one, although it does leave us craving Blu-ray. But if you're in the market for an affordable DVD player and don't, for some reason, want to embrace Blu-ray, this is a solid performer.